In road bicycle racing, a Grand Tour is one of the three major European professional cycling stage races: Giro d'Italia, Tour de France and Vuelta a España. Collectively they are termed the Grand Tours, and all three races are similar in format being multi-week races with daily stages. They have a special status in the UCI regulations: more points for the UCI World Tour are distributed in Grand Tours than in other races, and they are the only stage races allowed to last longer than 14 days. The Giro d'Italia is generally run in May, the Tour de France in July, and the Vuelta a España in late August and September. The Vuelta was originally held in the spring, usually late April, with a few editions held in June in the 1940s. In 1995, however, the race moved to September to avoid direct competition with the Giro d'Italia, held in May. The Tour de France is the oldest and most prestigious in terms of points accrued to racers of all three,, and is the most widely attended annual sporting event in the world, while the Giro d'Italia is generally seen as the second-most important. The Tour, the Giro and the Road World Cycling Championship make up the Triple Crown of Cycling. The three Grand Tours are events for men only, and no three week races exist on the women's road cycling circuit. The Giro Rosa, the ten stage Italian road race for women is the only race on the current women's circuit treated as broadly equivalent to a Grand Tour, although the defunct women's Tour de France was, in its time, given similar status. In their current form, the Grand Tours are held over three consecutive weeks and typically include two rest days near the end of the first and second week. The stages are a mix of long massed start races (sometimes including mountain and hill climbs and descents; others are flat stages favoring those with a sprint finish), as well as individual and team time trials and non-competitive exhibition and rest days. Unlike most one-day races, stages in the Grand Tours are generally under 200 kilometers in length. Controversy often surrounds which teams are invited to the event. Typically, the Union Cycliste Internationale (International Cycling Union) prefers top-rated professional teams to enter, while operators of the Grand Tours often want teams based in their country or those unlikely to cause controversy. From 2005 to 2007, organisers had to accept all ProTour teams, leaving only two wildcard teams per Tour. However, the Unibet team, a ProTour team normally guaranteed entry, was banned from the three Grand Tours due to gambling advertising laws. In 2008, following numerous doping scandals, some teams were refused entry to the Grand Tours: Astana did not compete at the 2008 Tour de France and Team Columbia did not compete at the 2008 Vuelta a España. Since 2011, under the UCI World Tour rules, all ProTour teams are guaranteed a place in all three events, and obliged to participate. The prizes include the individual general classification, the team classification, the King of the Mountains, the points classification, and often the best young rider classification, in addition to other less known classifications. The most contested ones are the individual general classification (general classification in the Tour de France, general classification in the Giro d'Italia, and general classification in the Vuelta a España) ; king of the mountains classification (mountains classification in the Tour de France, mountains classification in the Giro d'Italia, and mountains classification in the Vuelta a España); and points classification (points classification in the Tour de France, points classification in the Giro d'Italia, and points classification in the Vuelta a España). Only three riders have won all three in the same race: Eddy Merckx in the 1968 Giro d'Italia and 1969 Tour de France, Tony Rominger in the 1993 Vuelta a España and Laurent Jalabert in the 1995 Vuelta a España. It is rare for cyclists to ride all grand tours in the same year; in 2004, 474 cyclists started in at least one of the grand tours, 68 of them rode two Grand Tours and only two cyclists started in all three grand tours. It is not unusual for sprinters and their leadout men, who do not expect to complete each race, to start each of the Grand Tours and aim for stage wins before the most difficult stages occur. Alessandro Petacchi and Mark Cavendish started all three Grand Tours in 2010 and 2011, respectively, as did some of their preferred support riders. For both riders in both years, only the Tour de France was ridden to its conclusion. Over the years, 32 riders have completed all three Grand Tours in one year. Of these, Adam Hansen is the only one to do so five times. Marino Lejarreta has done it four times, Bernardo Ruiz three times, Eduardo Chozas and Carlos Sastre twice each, and 27 more riders have achieved the feat once. The only riders to have finished in the top 10 in each of the three tours during the same year are Raphaël Géminiani in 1955 and Gastone Nencini in 1957. Only three countries have won all three Grand Tours in a single year: France (1964), Spain (2008) and Great Britain (2018). Out of those three countries, Great Britain completed the set with three different riders. For the UCI World Tour, more points are given in grand tours than in other races; the winner of the Tour de France receives 1000 points, and the winners of the Giro and Vuelta receive 850 points. Depending on the nature of other races, points vary for the winner of the overall classification The grand tours have a special status for the length: they are allowed to last between 15 and 23 days. A. a b c d e f g Lance Armstrong was declared winner of seven consecutive tours from 1999 to 2005. However, in October 2012, he was stripped of all titles by the UCI due to his use of performance-enhancing drugs. Organizers of the Tour de France announced that the winner's slot would remain empty in the record books, rather than transfer the win to the second-place finishers each year. However, in October 2014, the Tour de France resumed listing Armstrong as a previous winner of the tour, but with his name crossed out. Active riders marked in bold. Jacques Anquetil (FRA): 5 Tours (1957, 1961, 1962, 1963, 1964), 2 Giro (1960, 1964), 1 Vuelta (1963). Vincenzo Nibali (ITA): 1 Tour (2014), 2 Giro (2013, 2016), 1 Vuelta (2010). Chris Froome (GBR): 4 Tours (2013, 2015, 2016, 2017), 1 Giro (2018), 1 Vuelta (2017). Hinault and Contador are the only cyclists to have won each Grand Tour at least twice. Bernard Hinault (FRA): 3 Grand Tours - Giro (1982), Tour (1982), Vuelta (1983). Chris Froome (GBR): 3 Grand Tours - Tour (2017), Vuelta (2017), Giro (2018). No cyclist has ever won all three Grand Tour events in the same year. Ten riders have achieved a double by winning two grand tours in the same calendar year. Of the above ten, Pantani, Roche and Battaglin's doubles were their only Grand Tour victories in their careers. Only two cyclists have placed in the top ten at all three Grand Tours in the same calendar year: Raphaël Géminiani in 1955 and Gastone Nencini in 1957. The margins between the winner of a Grand Tour and the runner-up are often narrow, and rarely larger than a few minutes. The Grand Tour winner with the biggest margin to the runner-up is Maurice Garin (FRA), who finished the first Tour de France in 1903 three hours faster than the second placed rider. The biggest win margin in the history of Giro d'Italia was in 1914 when Alfonso Calzolari (ITA) won by almost two hours, and the biggest margin seen in the history of Vuelta a España was in 1945 when Delio Rodríguez (ESP) finished with a 30 minute gap to the runner-up. The Tour/Giro/Vuelta triple has been achieved by two riders – Federico Bahamontes (ESP) and Luis Herrera (COL). The Tour/Giro/Vuelta triple has been achieved by five riders – Djamolidine Abdoujaparov (UZB), Mark Cavendish (GBR), Laurent Jalabert (FRA), Eddy Merckx (BEL) and Alessandro Petacchi (ITA). The Tour/Giro double has been achieved by two riders – Nairo Quintana (COL) and Andy Schleck (LUX). The Giro/Vuelta double has been achieved by one rider – Miguel Ángel López (COL). Three cyclists have won stages in all three of the Grand Tours in the same season: Miguel Poblet (ESP) in 1956, Pierino Baffi (ITA) in 1958 and Alessandro Petacchi (ITA) in 2003. Cyclists whose names are in bold are still active. This list is complete up to and including the 2017 Vuelta a España. The rider with the most Grand Tour wins in one season is Freddy Maertens (BEL) who won 20 Grand Tour stages in 1977. After winning 13 (out of 19) stages in the Vuelta a España, he won 7 stages in the Giro d'Italia before abandoning the race with a broken wrist after a crash on the first of the two half-stages on the eight day of the race. Only 34 riders have finished all three Grand Tours in one season. Adam Hansen has done this six times, Marino Lejarreta four times and Bernardo Ruiz achieved it in three different years, while Eduardo Chozas and Carlos Sastre have completed the accomplishment twice. The rider with most participations on Grand Tours is Matteo Tosatto with 34 (12 Tours, 13 Giros and 9 Vueltas). The rider who has finished most Grand Tours is also Matteo Tosatto, with 28 (12 Tours, 11 Giros and 5 Vueltas). Adam Hansen has finished the most consecutive Grand Tours: 20 tours from 2011 Vuelta a España till 2018 Giro d'Italia. The best average finish was the first time three Grand Tours were finished in one season, when Raphaël Géminiani finished 4th, 6th and 3rd in the Giro, Tour and Vuelta, respectively. ^ a b c "UCI Cycling regulations—Part 2: Road Races" (PDF). January 1, 2017. p. 64. Retrieved 2017-07-06. ^ a b "UCI Cycling regulations". p. 41. Archived from the original on 2011-06-23. Retrieved 2012-07-20. ^ McMahon, Daniel. "Tour de France, world's biggest annual sporting event, is an amazing race and breathtaking logistical feat". Business Insider. ^ "Tony Rominger". Cycling Hall of Fame.com. 1961-03-27. Retrieved 2012-07-20. ^ Riche, Antoine (19 March 2005). "Doubler deux Grands Tours revient à la mode" (in French). CyclisMag. Archived from the original on 20 November 2010. Retrieved 11 November 2010. ^ "Tour de France shorts: Armstrong is back, an Alpine Etape du Tour". Cyclingnews.com. ^ a b c d "Historical Results – The Grand Tours". Retrieved 2012-07-20. ^ "Petacchi equals Poblet and Baffi". cyclingnews.com. September 9, 2003. ^ "Giro d'Italia 2009" (pdf). Infostrada sports. 2009. p. 208. Retrieved 29 June 2011. ^ "Le Tour en chiffres : Les vainqueurs d'étapes" (PDF). ASO. Archived from the original (PDF) on 2010-07-16. Retrieved 2010-07-26. ^ "Tour Xtra: Tour Records". cvccbike.com. 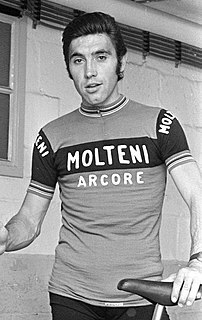 Édouard Louis Joseph, Baron Merckx, better known as Eddy Merckx, is a Belgian former professional road and track bicycle racer who is widely seen as the most successful rider in the history of competitive cycling. His victories include an unequalled eleven Grand Tours, all of the five Monuments, three World Championships, the hour record, every major one-day race other than Paris–Tours, and extensive victories on the track. A sprinter is a road bicycle racer or track racer who can finish a race very explosively by accelerating quickly to a high speed, often using the slipstream of another cyclist or group of cyclists tactically to conserve energy. Alessandro Petacchi is an Italian former professional road racing cyclist, who last rode for the Southeast Pro Cycling team. A specialist sprinter, Petacchi has won 48 grand tour stages with wins of the points jersey in the Giro d'Italia in 2004, the Vuelta a España in 2005 and the Tour de France in 2010. He also won the classics Milan – San Remo in 2005 and Paris-Tours in 2007. His career spanned over 18 years during which he earned 183 victories. Henri "Rik" Van Looy is a Belgian former professional cyclist of the post-war period, nicknamed the King of the Classics or Emperor of Herentals. He was twice world professional road race champion, and was the first cyclist to win all five 'Monuments': the most prestigious one-day classics – a feat since achieved by just two others. With 379 road victories he's second to Merckx only. He is ninth on the all-time list of Grand Tour stage winners with thirty-seven victories. Francesco Moser, nicknamed "Lo sceriffo", is an Italian former professional road bicycle racer. Abraham Olano Manzano is a Spanish former professional road racing cyclist, who raced between 1992 and 2002. He won the World Road Championship in 1995, and the World Time Trial Championship in 1998, becoming the first and so far only male cyclist to win both. José Manuel Fuente Lavandera was a professional road racing cyclist and noted climbing specialist. The combination classification is one of the primary awards in the Vuelta a España cycling stage race. This classification is calculated by adding the numeral ranks of each cyclist in the general, points, and mountains classifications, with the lowest cumulative total signifying the leader of this competition. The Giro d'Italia is an annual road bicycle race held in May. Established in 1909 by newspaper La Gazzetta dello Sport, the Giro is one of cycling's three "Grand Tours"; along with the Tour de France and the Vuelta a España. The race usually covers approximately 3,500 kilometres (2,200 mi), passing through Italy and neighbouring countries such as France. The race is broken into day-long segments, called stages. Individual finishing times for each stage are totalled to determine the overall winner at the end of the race. The course changes every year, but has traditionally finished in Milan. The Vuelta a España is an annual road bicycle race. Established in 1935 by the Spanish newspaper Informaciones, the Vuelta is one of cycling's three "Grand Tours", along with the Tour de France and the Giro d'Italia. Initially, the race was held in April/May, but in 1995 it was moved to September. The race usually covers approximately 3,500 kilometres (2,200 mi), although this has varied, passing through Spain and countries with a close proximity in Europe. The race is broken into day-long segments called stages. Individual finishing times for each stage are totalled to determine the overall winner at the end of the race. The course changes every year, but has traditionally finished in Madrid. The Grand Tours are the three most prestigious multi-week stage races in professional road bicycle racing. The competitions are the Giro d'Italia, Tour de France and Vuelta a España, contested annually in that order. They are the only stage races permitted to last longer than 14 days. No cyclist has won all three Grand Tours in the same calendar year, but Eddy Merckx, Bernard Hinault and Chris Froome have won all three in succession. The only other cyclists to win all three Grand Tours at some point in their career are Jacques Anquetil, Felice Gimondi, Alberto Contador, and Vincenzo Nibali. Contador is the youngest, at 25 years, to win every Tour. It is rare for cyclists to ride all Grand Tours in the same year; in 2004, for example, 474 cyclists started in one of the Grand Tours, 68 rode two and only two cyclists started all three. The Grand Tours are the three most prestigious multi-week stage races in professional road bicycle racing. The competitions are the Giro d'Italia, Tour de France and Vuelta a España, contested annually in that order. They are the only stage races permitted to last longer than 14 days. No cyclist has won all three Grand Tours's points classifications in the same year; the only cyclists to win all three Grand Tours's points classifications in their career are Djamolidine Abdoujaparov, Mark Cavendish, Laurent Jalabert, Eddy Merckx and Alessandro Petacchi. It is rare for cyclists to ride all Grand Tours in the same year; in 2004, 474 cyclists started in one of the Grand Tours, 68 rode two and two cyclists started all three. The Grand Tours are the three most prestigious multi-week stage races in professional road bicycle racing. The competitions are the Giro d'Italia, Tour de France and Vuelta a España, contested annually in that order. They are the only stage races permitted to last longer than 14 days. No cyclist has won all three Grand Tours's mountains classifications in the same year; the only cyclists to win all three Grand Tours's mountains classifications in their career are Federico Bahamontes and Luis Herrera. It is rare for cyclists to ride all Grand Tours in the same year; in 2004, 474 cyclists started in one of the Grand Tours, 68 rode two and two cyclists started all three. The 2017 Vuelta a España was a three-week Grand Tour cycling stage race that took place in Spain between 19 August and 10 September 2017. The race was the 72nd edition of the Vuelta a España and the final Grand Tour of the 2017 cycling season. The race started in Nîmes, France, and finished in Madrid. It was the first time the race has started in France and only the third time it has started outside Spain, after 1997 (Portugal) and 2009 (Netherlands).